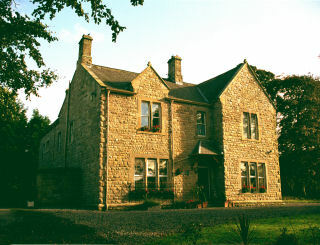 The Mews is situated in the West-wing of The Old Rectory; a handsome house built in 1871 for the Reverend of the Parish. The entrance to the Mews is through the original courtyard where it is effortless to imagine the echoes of the horses and carriages that would have transported visitors to and from the Rectory before the advent of the car. Beautifully refurbished to a very high modern standard, and tastefully preserving its Victorian charm, the Mews is a ground floor apartment, which sleeps up to 5. A separate entrance from the courtyard leads into a large and imposing sitting room which has kept its original window shutters and hand-carved stone fireplace with an Italian limestone hearth. There is a TV and DVD player, so guests may bring a selection of their favourite DVDs. The large window looks out onto the garden and fells beyond and from here you can contemplate the Californian Sequoia believed to be nearly 200 years old. From this room a 45 foot long hallway extends through the property from which the other rooms can be found. The large and airy kitchen is fully fitted with an up-to-date design incorporating a stainless steel range cooker within the original fireplace. Cooking facilities include an oven, hob, grill. Other appliances include a fridge/freezer, microwave, toaster, kettle. The kitchen is very well equipped with cafetiere, pans/casserole dishes/baking tins etc., even a milk frother for making lattes etc. There is also enough crockery and utensils for 8. A separate utility room is situated off the rear entrance hall. It contains a washing machine and tumble dryer, clothes airer, iron, ironing board (plus stuff like mop & bucket etc). The access to the rear patio area/small garden is through this room. The master bedroom is tastefully furnished with a double and single bed in white wrought iron. This room can be used as a double, twin or family room. A cot and highchair can be provided. Furniture includes wardrobe, chest of drawers plus bedside cabinets and chair. The ensuite shower room also has a heated towel rail. This bedroom is cozily furnished with a traditional iron and brass bed (bedknobs and broomsticks style!). This room also features an original fireplace and the furniture includes wardrobe with drawers, bedside cabinets and chair. The bathroom has a contemporary design comprising a free-standing bath with shower attachment, toilet, hand basin, chrome heated towel rail and a chrome/glass floor-standing shelving unit. The rear entrance hall has a coat hanging rail and space for boots etc. A rear door guides you out to the patio area which has a garden table and chairs and a gas barbeque. In the evening you can gaze at the stunning sunsets forming over the northern fells and if you are lucky, on a clear night, perhaps the Aurora Borealis! Nestling on the side of a Cumbrian fell, with panoramic views extending the majestic Skiddaw, Solway Firth and Galloway hills; Uldale meaning “Valley of the Wolves” is one of the Lake Districts best kept secrets. 'Far from the madding crowd' and leaving everyday life behind, the magnificence of the mountains can be enjoyed in absolute peace and solitude. Known as ‘The Back O’ Skidda”, Uldale is surrounded by rolling fells and is still largely undiscovered by tourism. Mostly unchanged in centuries, a picturesque landscape of farming hamlets, ancient market villages, traditional whitewashed churches and winding single-track roads, await you. The area is plentiful in wildlife; common sights include buzzards sweeping overhead and squirrels scampering through the woodland. If you are fortunate you may catch a glimpse of the ospreys that nest every year at the nearby Bassenthwaite lake. Uldale is a wonderful starting point for a variety of walks. You can ascend the Skiddaw Massif or ramble along the Uldale and Caldbeck commons and through the Ellen valley. There is a fine village pub, The Snooty Fox dating back to before 1700, where the locals are friendly and the food is exceptional, drawing people from afar. 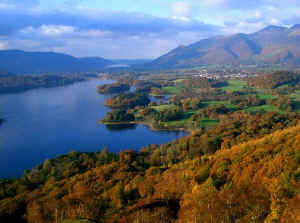 M6 from the South: Leave the M6 motorway at junction 40 and take the A66 towards Keswick, for 17 miles. As you approach Keswick stay on the A66 until you reach the Crosthwaite roundabout. Turn right at the 3rd exit; take the A591. Follow this road for approximately 6 miles until you reach the Castle Inn. Turn right to Uldale. Follow the road for 4 miles to the centre of the village. At the crossroads, turn left towards Ireby. The Old Rectory and the Mews are 200 metres on the right. M6 from the North: Leave the M6 at junction 41 and take the B5305 towards Wigton. Follow the signs for Caldbeck. In Caldbeck take the B5299 to Uldale. At the crossroads after the steep descent turn right towards Ireby. The Old Rectory and the Mews are 200 metres on the right. By Rail: Carlisle and Penrith are the two nearest mainline rail stations. Both are on the West Coast Main line which runs between London and Glasgow. Car rental is available at Carlisle. Electricity is included in the price as well as linen and towels. A welcome pack is also provided which includes tea, coffee, hot chocolate and toiletries. There is a security bond of £100, which will be refunded after the holiday, providing there are no breakages and that the apartment is left in a good state.